As in the attacking techniques, many of the parries used in karate are 'focused'. That is to say, one's entire strength is concentrated at the point and the moment of impact, after which the muscles are immediately relaxed. As a result, pain or even injury may be inflicted with the parry alone, and the opponent sufficiently discouraged from attempting any further attack. When parrying, however, you should always have a counterattack ready to follow up with. Be sure that you maintain a good posture and balance and try always to take advantage of your opponent's momentum and strength to upset his balance and posture. Age-uke (rising block). Usually used to parry an attack to the face (jodan). This block begins with the fist palm upward just above the waist. At the finish, the fist is at a point approximately twelve inches in front of and six inches above the opposite ear. At the last moment the fist is flicked over so that the palm faces away from you and the opponent's attacking arm is struck by the outer edge of the forearm near the wrist. Simultaneously, the other hand is withdrawn from a point somewhere in front of the face to the usual ready position. It is important that the elbow of the parrying arm should be lower than the fist at the moment of impact. Soto-uke (outside forearm block), a parry capable of inflicting considerable damage. It is usually used against attack to the solar plexus (chudan). With the elbow bent, swing the fist from above the shoulder down in front of the body. Focus strongly, snapping the fist so that the palm faces toward you. At this point, the fist should be about level with the shoulder and the elbow in front of the body (not to the side). The same striking surface is used as in the rising block. Uchi-uke (inside forearm block). This technique is also used to parry attacks to the solar plexus. At the finish, the arm is in precisely the same position as in the outer block. However, it begins with the fist palm downward at the ready position on the opposite side of the body and the striking surface is the inside edge of the forearm. Gedan-barai (downward sweep). Another strong defensive technique, useful against attacks to the solar plexus, stomach or groin (gedan), and particularly employed against kicks. The fist is carried to a point near the opposite ear, palm facing the ear, then swung diagonally downward. At the finish, the arm is extended in front of the body and the fist twisted palm downward. Strike the attacking arm or leg with the outside edge of the forearm and to avoid damage to the wrist be sure to clench the fist as tightly as possible. 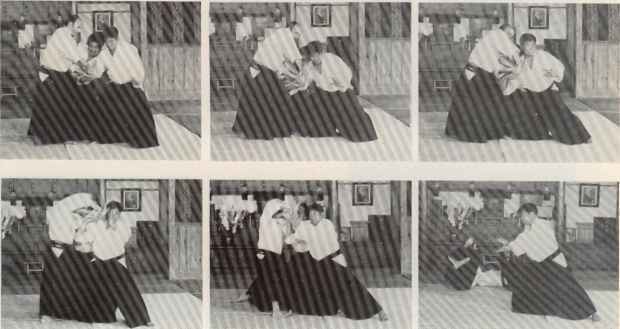 Note that like the three preceding parries this one is very strong against attacks from the front, and so is usually performed from a forward or diagonal straddle stance. Sometimes, however, these parries (with the exception of the rising block) may be used to the side in the straddle stance. Shuto-uke (knife-hand block). 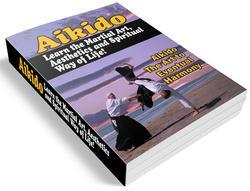 Once mastered, this is a very fast parry, and one moreover that leaves one in a good position for the counter attack. It is used chiefly against attacks to the solar plexus. The hand begins from the same position as the fist in the downward sweep, palm facing the ear. Cut downward with the forearm and finish with the palm facing diagonally forward, the hand and elbow in line with the shoulder and the hand more or less level with the shoulder. Simultaneously with this parry, the other hand is pulled from a position straight in front of the body, palm downward, to the middle of the chest, palm upward. This technique is commonly used while retreating and is conveniently executed from the back stance. As with the attacking techniques in Chapter 8, it is most important with all these hand techniques that the shoulders be pulled down and the 'fixation' muscles of the chest and back strongly tensed at the moment of focus.